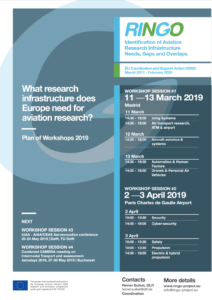 The European research project RINGO (Research Infrastructures Needs, Gaps and Overlaps) has scheduled four workshops this spring to collect information about the existing and future needs of aviation research infrastructures. They will be held on the 11-13th of March 2019 in Madrid (Spain); on the 2-3rd of April 2019 at Charles de Gaulle Airport in Paris (France); between the 20-24th of May 2019 in Delft (Netherlands); and between the 27-30th of May 2019 in Bucharest (Romania). Register to the RINGO workshops or contact Jelmer Reitsma for any further information.